A plane releases chemical dispersant to break up an oil slick on the water surface below. Photo courtesy of the National Commission on the Deepwater Horizon Oil Spill and Offshore Drilling. 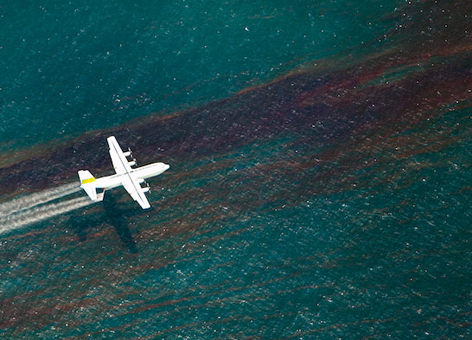 MAY 8, 2012 -- Help NOAA expand what we know about the effects of chemical dispersants on both spilled oil and the marine environment: funding for research projects is now available. The explosion and subsequent well blowout on the Deepwater Horizon drilling rig on April 20, 2010, led to the largest oil spill in United States history. The unprecedented use of chemical dispersants on and below the ocean's surface during this oil spill raised scientific, public, and political questions about both their effectiveness and their potential consequences for ecosystems and marine life in the Gulf of Mexico. To help answer those questions, NOAA is partnering with the Coastal Response Research Center at the University of New Hampshire to fund research on dispersants and dispersed oil. The focus will be in the following areas: 1) dispersants and risk communication; 2) degradation of dispersants and dispersed oil; and 3) biological effects of dispersants and dispersed oil on surface and deep ocean species. The request for research proposals is available at the Center's website. Researchers interested in submitting a proposal need to turn in a letter of interest by May 15, 2012. The Coastal Response Research Center was established in 2004 as a hub for oil spill research, development, and technical knowledge transfer. The Center is a partnership between the University of New Hampshire and those of us at NOAA's Office of Response and Restoration. The Center collaborates with other federal, state, and local research and development programs to promote effective protection, assessment, and restoration of coastal areas and resources. The overall goal of the Center is to reduce both the potential for, and the consequences of, spills and other hazards threatening coastal environments and communities. Advances in science and technology relating to spills will be applied to other types of threats to coastal environments and communities, when possible. Preventing a spill is always the preferred scenario, but as long as we explore, drill, and transport oil, there will be a chance for spills. And once oil is spilled, we can no longer prevent harm from happening to the marine environment, but we can reduce that harm through a combination of response measures. With our partner at the Coastal Response Research Center, we hope to improve the science of spill response before the next oil spill happens, so that when it unfortunately does occur, we are better prepared to deal with it.